This essay, originally written in May 2013, has now been published in the inaugural issue of Re-Imagining Magazine, a publication created by the Chicago Wisdom Project. “To speak, to ask to have audience today in the world, requires that we speak to the world, for the world is in the audience; it too is listening to what we say.” With these words James Hillman opens his essay “Anima Mundi” in which he speaks of the return of soul to the world. Such is the task we face as a species, as human beings, as we learn to cultivate a different kind of relationship with our planet, the Earth which supports our very existence. But what eyes can we use to see the soul of the world? What languages can we speak to call out to the anima mundi? With what ears shall we listen to hear the Earth’s voices in reply? James Hillman, The Thought of the Heart and the Soul of the World (Putnam, CT: Spring Publications, Inc., 2007), 91. On this last New Moon of 2015, I am sharing the introduction to my comprehensive exam on the works and context of J.R.R. Tolkien, the composition of which has been my primary occupation over the last seven months. This is the first of two comprehensive exams to be written for my dissertation on the Red Books of Tolkien and C.G. Jung. Because much of the material in the exam will be included in my dissertation I am not posting it publicly, rather allowing it to gestate until the full book is ready to publish. But I wished to share something of the labor of love in which I have been most recently engaged. Thy starlight on the Western Seas. When Professor J.R.R. Tolkien of Oxford, England set out to write a mythology, he did not know he would end up writing one of the most beloved works of literature of the 20th century. Indeed, he did not know of Hobbits or the King of Gondor, or even of Mount Doom. But he did know about Elves, and Middle-Earth, the endless Sea, and the far shores of Faërie. He knew he wanted to write poems and tell stories that had a particular “quality of strangeness and wonder,” stories that would bring “the satisfaction of certain primordial human desires”: the desire “to survey the depths of space and time” and “hold communion with other living things.” And this he did, penning thousands of pages that came to tell the many myths of Middle-Earth. Over the course of his lifetime, Tolkien published the books The Hobbit and The Lord of the Rings, the short stories Leaf by Niggle, Farmer Giles of Ham, and Smith of Wootton Major, and the book of poetry The Adventures of Tom Bombadil and Other Verses from the Red Book. He translated the medieval English poems Sir Gawain and the Green Knight, Pearl, and Sir Orfeo, and wrote scholarly papers on Beowulf and the Ancrene Wisse. But, except for the twelve long years dedicated to the composition of his masterwork, The Lord of the Rings, Tolkien’s primary creative occupation was writing and re-writing the cosmogonic myths and epic tales of the Silmarillion, a book never published in his lifetime. Indeed, when he passed away in 1973, he left behind him “the serried ranks of box files that contained . . . like beads without a string, the raw material of ‘The Silmarillion.’” As his publisher Rayner Unwin says: “although over the years some authors have written at greater length, few if any have left behind a more purposeful yet inchoate creative complexity than Tolkien.” But, thanks to the decades-long effort of Tolkien’s son Christopher, the world can now read these pages, published as a compact narrative in The Silmarillion, and in the vast drafts and retellings found in Unfinished Tales and the twelve volumes of The History of Middle-Earth. Who knows what form the Silmarillion may have taken if Tolkien had given it the same level of perfectionist revisioning that he gave The Lord of the Rings. But perhaps that is not how the tales of the Silmarillion were meant to be told. Perhaps they were meant to be received in the way primary myth is: with overlapping narratives and changing names, some stories drawn with great detail in both poetry and prose, others sketched as tales to be glimpsed in the background. Exploring the world of Middle-Earth can be like crossing a threshold into another realm, losing sight even of the pages in one’s hands, as far landscapes and poignant beauties pierce to the depths of one’s experience. As his philological collaborator Simone D’Ardenne writes, “Tolkien’s personality was so rich, so diverse, so vast and so elusive” that to paint any portrait of his life will inherently be inadequate. Although born in South Africa in 1892, Tolkien spent the majority of his life in England, only going to the European continent a few times, or occasionally across the water to Ireland. But this does not mean he was untraveled. Tolkien arguably explored more distant lands than many, but they are lands only found in the imagination. In this comprehensive exam I seek to understand Tolkien’s life and work in the context of his imaginal experiences, and the people and ideas that supported him in having them. I begin with Tolkien’s family and friends, the literary midwives who helped him bring his mythology to birth. From there I turn to Tolkien’s artwork, the paintings, drawings, and sketches that he made before his writing had begun to take shape. I focus primarily on the early years when he was illustrating The Book of Ishness, although Tolkien continued throughout his life to make beautiful works of art to accompany his stories. From these images I shift to language, the subject that was central to the person Tolkien was. Not only was he a professional philologist and professor of Anglo-Saxon, first at Leeds University and later at Oxford, he was an artist of language as well, inventing words, grammar, and etymology for multiple languages of Middle-Earth. Finally, I turn to an exploration of Tolkien’s experience of the imagination, looking particularly through the lens of his theory of Sub-creation. 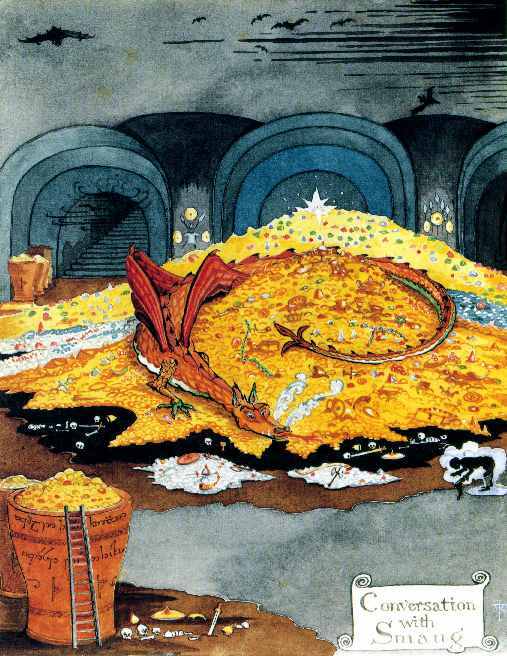 To conclude, I touch on the connection between Tolkien’s work and The Red Book of C.G. Jung, the subject on which my subsequent dissertation will be focused. Tolkien’s personality was multifaceted; one could encounter him as “the Christian, or the friend, the artist or the humanist, the father or the teacher,” as D’Ardenne writes. Many possibilities are open to us for exploring who he was. In an obituary written long in advance of Tolkien’s death, his close friend C.S. Lewis says: “He was a man of ‘cronies’ rather than of general society and was always best after midnight (he had a Johnsonian horror of going to bed) and in some small circle of intimates where the tone was at once Bohemian, literary, and Christian.” If he was best in his small circle of intimates, perhaps that is the place to meet him first—among his own Fellowship. C.S. Lewis, qtd. in Philip Zaleski and Carol Zaleski, The Fellowship: The Literary Lives of the Inklings (New York, NY: Farrar, Straus and Giroux, 2015), 209. J.R.R. Tolkien, The Lord of the Rings: The Fellowship of the Ring (New York, NY: Houghton Mifflin Company, 1994), 78. J.R.R. Tolkien, On Fairy-Stories, ed. Verlyn Flieger and Douglas A. Anderson (London, England: HarperCollinsPublishers, 2014), 4. Unwin, “Early Days of Elder Days,” 6. Simone D’Ardenne, “The Man and Scholar,” in J.R.R. Tolkien, Scholar and Storyteller: Essays in Memoriam, ed. Mary Salu and Robert T. Farrell (Ithaca, NY: Cornell University, 1979), 33. D’Ardenne, “The Man and Scholar,” 33. C.S. Lewis, “Professor J.R.R. Tolkien: Creator of Hobbits and Inventor of a New Mythology” in J.R.R. Tolkien, Scholar and Storyteller: Essays in Memoriam, ed. Mary Salu and Robert T. Farrell (Ithaca, NY: Cornell University, 1979), 15. Barfield, Owen. Poetic Diction: A Study in Meaning. Oxford, England: Barfield Press, 2010. Caldecott, Stratford. 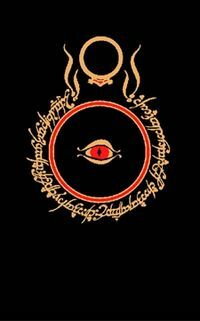 The Power of the Ring: The Spiritual Vision Behind The Lord of the Rings and The Hobbit. New York, NY: The Crossroad Publishing Company, 2012. Campbell, Joseph. The Hero with a Thousand Faces. Novato, CA: New World Library, 2008. Carpenter, Humphrey. The Inklings: C.S. Lewis, J.R.R. Tolkien, Charles Williams and Their Friends, London, England: HarperCollinsPublishers, 2006. –––––. J.R.R. Tolkien: A Biography. New York, NY: Houghton Mifflin Company, 2000. Chance, Jane, ed. Tolkien and the Invention of Myth. Lexington, KY: The University Press of Kentucky, 2004. –––––. Tolkien the Medievalist. Routledge Studies in Medieval Religion and Culture. New York, NY: Routledge, 2003. Croft, Janet Brennan and Leslie A. Donovan, eds. Perilous and Fair: Women in the Works and Life of J.R.R. Tolkien. Altadena, CA: Mythopoeic Press, 2015. Curry, Patrick. Deep Roots in a Time of Frost: Essays on Tolkien. Zürich, Switzerland: Walking Tree Publishers, 2014. –––––. Defending Middle-Earth. Edinburgh, Scotland: Floris Books, 1997. Dickerson, Matthew and Jonathan Evans. Ents, Elves, and Eriador: The Environmental Vision of J.R.R. Tolkien. Lexington, KY: The University Press of Kentucky, 2006. Duriez, Colin. The Oxford Inklings: Lewis, Tolkien and Their Circle. Oxford, England: Lion Books, 2015. –––––. Tolkien and C.S. Lewis: The Gift of Friendship. Mahwah, NJ: Hidden Spring, 2003. –––––. Tolkien and The Lord of the Rings: A Guide to Middle-Earth. Mahwah, NJ: Hidden Spring, 2001. Edwards, Raymond. Tolkien. London, England: Robert Hale Limited, 2014. Flieger, Verlyn. “But What Did He Really Mean?” Tolkien Studies 11 (2014): 149-66. –––––. Green Suns and Faërie: Essays on J.R.R. Tolkien. Kent, OH: The Kent State University Press, 2012. –––––. Interrupted Music: The Making of Tolkien’s Mythology. Kent, OH: The Kent State University Press, 2005. –––––. A Question of Time: J.R.R. Tolkien’s Road to Faërie. Kent, OH: The Kent State University Press, 1997. –––––. 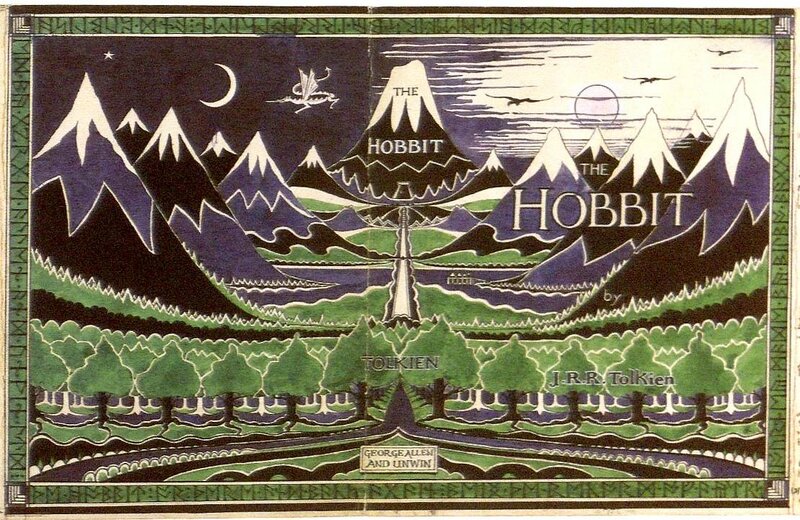 Splintered Light: Logos and Language in Tolkien’s World. Kent, OH: The Kent State University Press, 2002. Flieger, Verlyn and Carl F. Hostetter, eds. Tolkien’s Legendarium: Essays on The History of Middle-Earth. Westport, CT: Greenwood Press, 2000. Garth, John. Tolkien and the Great War: The Threshold of Middle-Earth. New York, NY: Houghton Mifflin Company, 2003. Hammond, Wayne G. and Christina Scull. The Art of The Hobbit by J.R.R. Tolkien. New York, NY: Houghton Mifflin Harcourt Publishing Company, 2012. –––––. The Art of The Lord of the Rings by J.R.R. Tolkien. New York, NY: Houghton Mifflin Harcourt Publishing Company, 2015. –––––. J.R.R. Tolkien: Artist & Illustrator. New York, NY: Houghton Mifflin Company, 2000. Kyburz, John Peck, and Sonu Shamdasani. New York, NY: W.W. Norton & Company, 2009. Knight, Gareth. The Magical World of the Inklings. Cheltenham, England: Skylight Press, 2010. Lang, Andrew. The Red Fairy Book. Mineola, NY: Dover Children’s Classics, 1966. Lee, Stuart D. ed. A Companion to J.R.R. Tolkien. New York, NY: John Wiley & Sons, Ltd., 2014. Lobdell, Jared, ed. A Tolkien Compass. Chicago, IL: Open Court Publishing Company, 2003. Lönnrot, Elias. Kalevala: Land of Heroes. Translated by W.F. Kirby. London, England: Everyman’s Library, 1966. Milbank, Alison. Chesterton and Tolkien as Theologians: The Fantasy of the Real. New York, NY: T&T Clark, 2007. Noel, Ruth S. The Languages of Tolkien’s Middle-Earth. Boston, MA: Houghton Mifflin Company, 1974. O’Neill, Timothy R. The Individuated Hobbit: Jung, Tolkien and the Archetypes of Middle-Earth. Boston, MA: Houghton Mifflin Company, 1979. Owens, Lance. “Lecture I: The Discovery of Faërie.” In J.R.R. Tolkien: An Imaginative Life. Salt Lake City, UT: Westminster College, 2009. http://gnosis.org/tolkien/lecture1/index.html. –––––. “Tolkien, Jung, and the Imagination.” Interview with Miguel Conner. AeonBytes Gnostic Radio, April 2011. http://gnosis.org/audio/Tolkien-Interview-with-Owens.mp3. Reilly, R.J. Romantic Religion: A Study of Barfield, Lewis, Williams, and Tolkien. Athens, GA: University of Georgia Press, 1971. Salu, Mary and Robert T. Farrell, eds. J.R.R. Tolkien, Scholar and Storyteller: Essays in Memoriam. Ithaca, NY: Cornell University, 1979. Scull, Christina and Wayne G. Hammond. The J.R.R. Tolkien Companion and Guide, Vol. 1: Chronology. New York, NY: Houghton Mifflin Company, 2006. –––––. The J.R.R. Tolkien Companion and Guide, Vol. 2: Reader’s Guide. New York, NY: Houghton Mifflin Company, 2006. Shippey, Tom. J.R.R. Tolkien: Author of the Century. New York, NY: Houghton Mifflin Company, 2002. –––––. The Road to Middle-Earth: How J.R.R. Tolkien Created a New Mythology. New York, NY: Houghton Mifflin Company, 2003. Skogemann, Pia. Where the Shadows Lie: A Jungian Interpretation of Tolkien’s The Lord of the Rings. Wilmette, IL: Chiron Publication, 2009. Tolkien, Christopher. Pictures by J.R.R. Tolkien. New York, NY: Houghton Mifflin Company, 1992. Tolkien, J.R.R. The Adventures of Tom Bombadil. Edited by Christina Scull and Wayne Hammond. London, England: HarperCollinsPublishers, 2014. –––––. The Annotated Hobbit. Annotated by Douglas A. Anderson. New York, NY: Houghton Mifflin Company, 2002. –––––. Beowulf. Edited by Christopher Tolkien. New York, NY: Houghton Mifflin Company, 2014. –––––. The Children of Húrin. Edited by Christopher Tolkien. New York, NY: Houghton Mifflin Company, 2007. –––––. The History of Middle-Earth. Vol. 1-12. Edited by Christopher Tolkien. New York, NY: Houghton Mifflin Company, 2010. –––––. The Letters of J.R.R. Tolkien. Edited by Humphrey Carpenter, with Christopher Tolkien. New York, NY: Houghton Mifflin Company, 2000. –––––. The Lord of the Rings. New York, NY: Houghton Mifflin Company, 1994. –––––. The Monsters and the Critics. Edited by Christopher Tolkien. London, England: HarperCollinsPublishers, 2006. –––––. On Fairy-Stories. Edited by Verlyn Flieger and Douglas A. Anderson. London, England: HarperCollinsPublishers, 2014. –––––. The Silmarillion. New York, NY: Houghton Mifflin Company, 2001. –––––. Sir Gawain and the Green Knight, Pearl, and Sir Orfeo. London, England: HarperCollinsPublishers, 1995. –––––. Smith of Wootton Major. Edited by Verlyn Flieger. London, England: HarperCollinsPublishers, 2005. –––––. Tales from the Perilous Realm. London: England: HarperCollinsPublishers, 1997. –––––. The Tolkien Reader. New York, NY: Ballantine Publishing Group, 1966. –––––. Unfinished Tales: Of Númenor and Middle-Earth. Edited by Christopher Tolkien. New York, NY: Houghton Mifflin Company, 1980. Zaleski, Philip and Carol Zaleski. The Fellowship: The Literary Lives of the Inklings. New York, NY: Farrar, Straus and Giroux, 2015. Zimbardo, Rose A. and Neil D. Isaacs, eds. Understanding The Lord of the Rings: The Best of Tolkien Criticism. New York, NY: Houghton Mifflin Company, 2004. Owen Barfield’s Poetic Diction—first published during his Saturn return—lays forth, in simple yet elegant terms, an argument for the evolution of consciousness. By tracing the differentiating meaning of words through the history of poetry, he reveals the participatory relationship of humanity with the cosmos. Barfield argues against the mainstream perspective held by philologists of his time that the origins of the words for abstract concepts find their roots in metaphors for concrete objects. Most philologists assumed words gained meaning by the use of intentional metaphors: for example, the contemporary word spirit has its roots in the ancient word for wind, therefore the assumption was that an ancient poet once decided to draw a metaphor between the blowing gusts of wind and the principle for life animating living beings. Barfield posits an alternative theory. From his understanding, these primal words are not metaphorical but rather contain within them the full meaning—the spectrum of spirit and wind and all between—in a single utterance. He writes that “these poetic, and apparently ‘metaphorical’ values were latent in meaning from the beginning.” Only over time, and through a changing of consciousness in human beings, is the “undivided meaning” of words split apart, so that now wind refers to a material reality and spirit to an abstract thought. Barfield argues that it is not the case that “the earliest words in use were ‘the names of sensible, material objects’ and nothing more.” Rather, one “must suppose the ‘sensible objects’ themselves to have been something more; you must suppose they were not, as they appear to be at present, isolated, or detached, from thinking and feeling.” Language, in Barfield’s view, reveals the ensoulment of the cosmos once perceptible to ancient human consciousness, a quality revealed through true metaphor. A true metaphor was once a single ancient word, a unified meaning expressed not only in human language but in the language of the world. Barfield’s thesis holds profound implications for a question often asked of astrologers: how was it that the ancients knew what names to give the planets so that their corresponding mythic figures expressed the same archetypal characteristics that are still carried in the astrological manifestations apparent today? How was the planet Venus aptly named after the Goddess of Beauty, or Mercury after the Messenger of the Gods, when Venus in the birth chart relates to love, beauty, romance, and artistic expression, and Mercury relates to communication, thought, speech, intellect, writing, and learning? The question is being asked with the same modern mindset as the philologists who assumed that consciousness has remained the same throughout time, and that humanity has only come to understand the world better through the acquisition of knowledge. Rather, as Barfield articulates, to ancient consciousness a physical object was inherently imbued with resonant, ensouled presence. This is the ‘undivided meaning’ of which Barfield speaks, the metaphor that exists latently in the word before a later consciousness has split it asunder. Our contemporary language cannot fully capture this ‘undivided meaning’ even as I try to describe it, because in the language I am using psyche and physis long ago diverged from one another. The consciousness that in modernity wiped away the horizon of meaning, to paraphrase Nietzsche, cannot perceive in the world the unity of archetype and object, universal and particular. They are fundamentally split, finally to the point of unrelatedness. Yet, reawakening within an archetypal cosmos, the unity of archetype and manifestation is once again apparent, but from the other side of a long history of differentiation. The undivided meaning of words has splintered again and again—the white light has passed through the prism to be refracted into a myriad of colors—and the consciousness living in a reenchanted, archetypally patterned world view can witness both the differentiation and unity at once. The language of the archetypes hearkens back to a time when the world reverberated with unified, ensouled, embodied meaning. Yet now it is possible, through conscious participation, to once again hear the song of the spheres. But instead of the cosmos simply singing to us as our ancestors once experienced it, we are able to read the score and, along with the cosmos, play its song back in harmony. Through his passion Barfield lets his readers feel the “beating heart of poetry” as it once lived, and to recognize that its poetic rhythm is the beating heart of the cosmos itself. 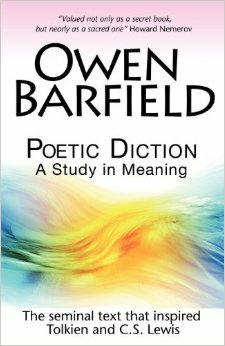 Owen Barfield, Poetic Diction: A Study in Meaning (Oxford, England: Barfield Press, 2010), 77. The window to the soul can have many frames. The soul of a poet already lends itself to rich symbolic interpretation, since it is in symbols and images that the poet expresses his imaginal world. One such symbolic frame to the soul is that of the astrological birth chart, which can provide an archetypal lens into the psyche of the individual. 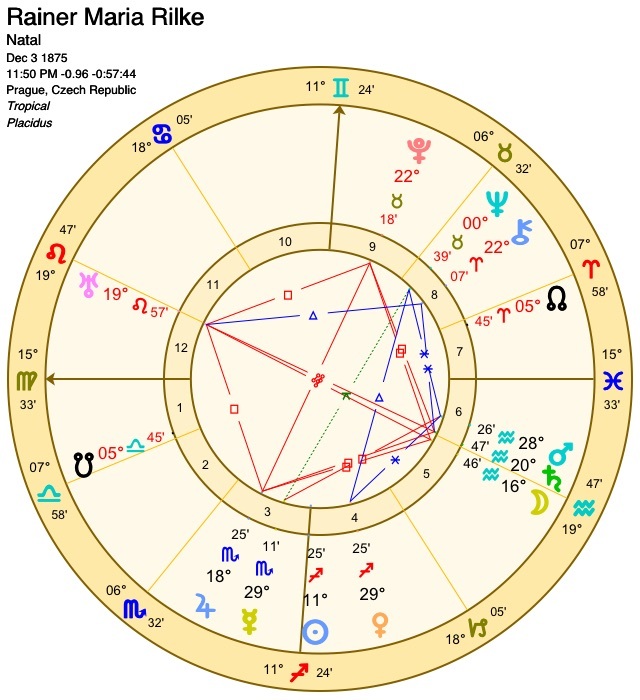 Born with six planets in a tight grand cross, the great poet Rainer Maria Rilke expressed the powerful dynamism of his birth chart through a lifetime of poetic works. 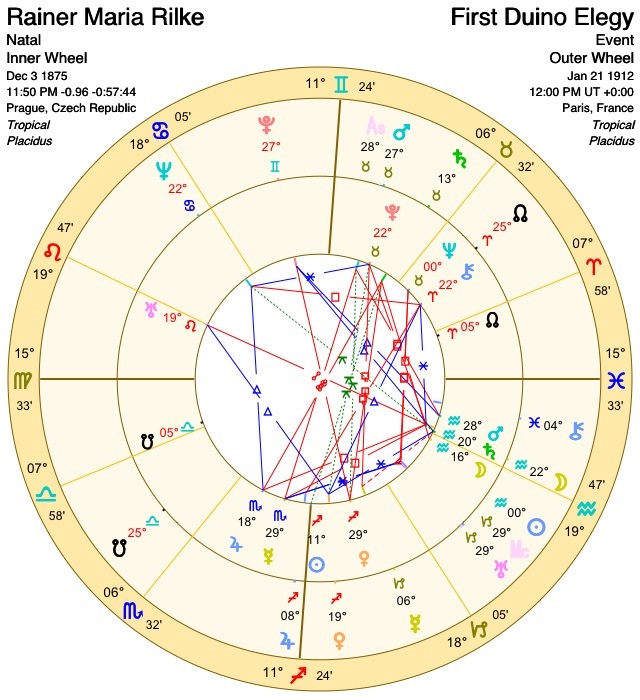 A deep exploration of Rilke’s birth chart and transits would fill volumes, so I will just lightly touch the surface in this essay, focusing first on some of the major aspects in his natal chart, and then looking at two pivotal moments in his life which, although seemingly disparate from the outside, symbolically seem to bookend Rilke’s journey in relation to his search for the “unknown beloved,” for the encounter with the divine feminine, the union with the Anima. These two pivotal moments on which I shall focus are the day when Rilke met Lou Andreas Salomé, his first great love, and when he began to write the Duino Elegies, considered by many to be his masterwork. The description Rilke’s mother gave of the day he was born is saturated with Christian symbolism, from his birth in the cold of winter at midnight, “the very hour at which our Saviour was born,” to his first gift of a tiny gold cross, bestowing upon him the gift of Jesus. Rilke’s birthday is December 4, 1875, although as best we know the exact time was in the last minutes of December 3, at 11:50 pm, in Prague. He is born with a triple conjunction of the Moon, Saturn, and Mars in Aquarius; this stellium forms a grand cross with Uranus in opposition, Pluto in a square to the Moon stellium and Uranus on one side, and a Mercury-Jupiter conjunction in a square to the Moon stellium and Uranus on the other side. Before even delving into the particular archetypal qualities of the planets and their various relationships to each other, I would like to draw attention to the symbol of the grand cross itself. A grand cross is made up of two oppositions and four squares. The quality of an opposition is that of powerful polarity, a tension of opposites in which the archetypal energies of the planets involved come into potent dialectic with each other. The quality of a square is that of dynamic challenge, sometimes with an unexpectedness to it, in which the archetypal energies can be in conflict or tension with one another. As hard aspects, both the opposition and the square can lend themselves to the growth and transformation of the individual through facing the obstacles, challenges, and crises these aspects can bring up. When these aspects come together to form a grand cross those powerful tensions and energies are multiplied and intensified. A grand cross can at times have the feeling of soul crucifixion, of being stretched across the polarities of one’s life, a simultaneous forcing together and pulling apart of oneself. Rilke’s grand cross can symbolically be seen in his dynamic and fraught relationship to Christianity, from his severely religious upbringing, to his unorthodox Visions of Christ, to the Duino Elegies, in which, as Daniel Polikoff writes, “we experience the signal events of the Passion—carrying of the cross, the crucifixion, entombment, and resurrection,” and to Rilke’s own sense of personal martyrdom. Rilke’s most intimate relationships did not begin or end solely in the personal sphere but catalyzed (and were catalyzed by) his connection with archetypal, impersonal factors, spiritual and imaginal realities that underlie and overlay the human realm, exceeding the bounds of ego consciousness. Much of Rilke’s emotional character can be seen in his Moon-Saturn conjunction, as well as its opposition to Uranus. The archetype of Saturn restricts, constrains, distances, and severs, while Uranus is the archetype of freedom, spontaneity, youth, and rebellion. Rilke’s Moon-Saturn can be recognized in his need for emotional distance and his lifelong sense of homelessness, but with the restlessness of Uranus in the aspect he also had a strong need for emotional freedom, and lived a life of nomadic wandering. In a letter ending a relationship with one of his lovers Rilke wrote: “Never forget that solitude is my lot, that I must not have a need for anyone, that all my strength in fact comes from my detachment . . . I implore those who love me to love my solitude.” With Pluto, which impels, drives, empowers, and deepens, squaring each of these planets as part of the grand cross, the need for emotional distance and freedom is intensified into a powerful force, in many ways driving the energies of Rilke’s life and relationships. His Moon square Pluto can also be seen in his many relationships with powerful women, women who not only had social power but great power of mind and personality as well. To complete the grand cross, Mercury and Jupiter are in a broad conjunction squaring Uranus. Mercury relates to all forms of communication, from thinking and speaking, to writing and, of course, to the art of poetry. Jupiter elevates and grants success upon that which it touches, and archetypally relates to abundance and magnitude. The generosity of words which flowed through Rilke over the course of his poetic career clearly relate to this archetypal combination, and Uranus can be seen in the ingenuity and brilliance with which Rilke executed his writing, as well as in the breakthrough success his works have been granted. Yet in order to bring these works of poetic genius into being, Rilke entered into many dark periods of suffering and despair, which is carried by the square of Saturn to Pluto in his grand cross. He had a “lifelong preoccupation with death” and was often held in the depths of depression, which relate to the tremendously powerful constraining force Saturn-Pluto can have upon one’s psyche. Yet instead of denying what these feelings were asking of him, Rilke was able to bring them forth and come into objective relationship with them, a desire particularly characteristic of the Moon-Saturn aspect. As Polikoff writes, “Rilke . . . craved, not to leave feelings behind, but to realize their mode of objective existence; to make, as the poet said, ‘things out of feelings,’ to lend ever more concrete existence to the soul’s innate longings.” It was just this which he achieved in his poetry, particularly his Dingedichte, which not only made ‘things out of feelings,’ but gave soul feeling to things. The day that Rilke met Lou Salomé, May 12, 1897, when he was only twenty-two years old, a powerful transformation was set into motion in Rilke’s soul. On that day there was a Venus-Mars square in the sky—the archetypal configuration related to romance in which Mars is the passion and fire that attract the Venusian lovers to one another—that was aligned right on Rilke’s natal Neptune. As his lover, Lou introduced Rilke to new ways of engaging with spirituality and religion as a means to attend to his own soul development, all of which are symbolized by the Neptune archetype. Also on that day the Sun happened to be aligned with Rilke’s natal Pluto opposite Mercury. He also had a longer transit of Saturn-Uranus, which were exactly conjunct in the sky at the time, conjoining his Mercury. The Saturn-Uranus complex relates to the Puer-Senex dialectic—Lou was fourteen years his elder—as well as the revolutionizing of traditional structures, rebellion against authority, and that which is old or constraining. But Saturn-Uranus is also the maturation of youth, the careful revision of that which has come before and the refinement of that which is yet to come. Rilke had already been experiencing this transit on his Mercury-Pluto—the part of his chart which correlates to the tremendous depth and transformative power of his poetry—for some time before he met Lou, but with the Sun highlighting the transit on the day they met one can see that moment as a symbol of the impact their relationship would have upon him and his work, transforming and revolutionizing the vision that he would spend his life learning to articulate. Furthermore, Rilke was also in the heart of a long transit of Pluto opposite his Sun, which would have been a long period of powerful and intense transformation of his sense of self. Lou clearly played a strong role in that metamorphosis. Rilke wrote the Elegies over a ten year period beginning in 1912, but left a long gap between late 1914 and 1922 when he finished the series. For this essay I will focus in particular on the transits to Rilke’s natal chart on the day he wrote The First Elegy, January 21, 1912, and glance briefly at some of the outer planet transits he experienced over the following three years as he wrote the next three Elegies. Rilke’s Duino Elegies effectively restyle Christ’s Passion as a work of human soul-consciousness. In reading the Duino Elegies, we experience the signal events of the Passion—carrying of the cross, the crucifixion, entombment, and resurrection—as they are reenacted in transformed form in the inner space of the speaker’s decidedly human subjectivity—a self-consciousness archetypally psychological and poetic at one and the same time. In this passage one can recognize the Promeathean-Uranean themes in restyling and revitalizing the Christian symbolism, but in such a way that draws on other Neptunian qualities such as soul-consciousness in relation to the archetypal, psychological, and the poetic. Another powerful, long-term transit Rilke was experiencing when he wrote the first four Elegies was the planet Pluto opposing his natal Venus. Furthermore, on the very day when Rilke wrote The First Elegy, the planet Mercury was forming an opposition to Pluto in the sky, therefore also conjoining Rilke’s Venus. This transit can be seen in the force and power of the voice carried in the Elegies, right from the first line: “Who, if I cried out, would hear me among the angels’/ hierarchies?” Over this time period as Pluto opposed Rilke’s Venus, it was also in a sextile to his natal Neptune, thus highlighting in different aspects his Venus-Neptune trine. The Elegies convey a powerful spiritual vision that plumbs the depths of the human soul, and burns with a passionate fire of love throughout. Pluto empowers and deepens the spiritual vision and soul expressive of Neptune, while Venus is reflected not only in the themes of love and the beloved throughout, but also the artistic medium of poetry itself. Over the course of this transit from Pluto, Rilke’s relationship to the beloved is being transformed, and the possibility of him encountering the beloved in his own soul, as the Anima, is now awakened. The great subject of the Elegies is nothing less than the nature and destiny of humanity, the contours of modern consciousness per se as these appear silhouetted against the abyss; the existential core of human being that begins to reveal hidden features even as its accustomed faces are torn away in the apocalyptic storm of the soul’s dark night. Much more could be said about Rilke’s process of writing the Duino Elegies and the corresponding transits that unfolded over the course of the decade in which he wrote them. The archetypal symbols carried by an individual person take a lifetime to unfold, and still they could not be exhausted. 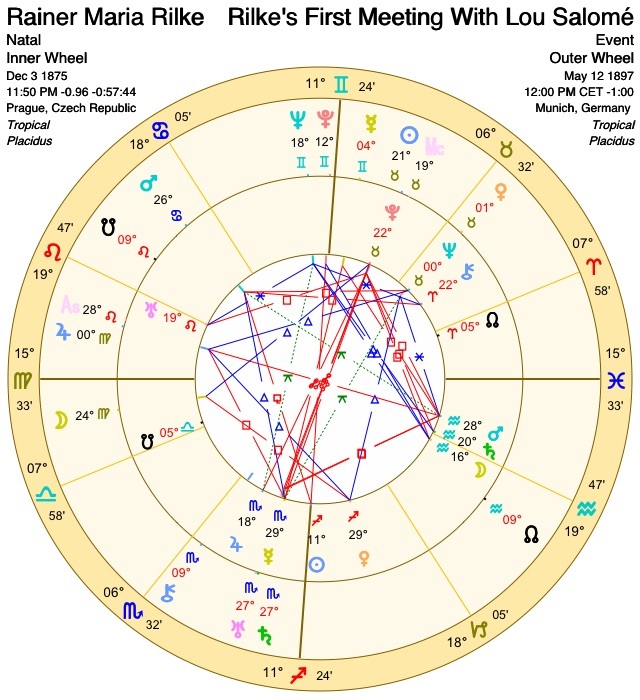 Rilke came into his life bearing an immensely complex chart, one that must have indeed been challenging to carry, the weight of the grand cross in particular not unlike a soul crucifix to be born through the dark valleys of depression. Yet it is the most challenging aspects that can forge us into who we are meant to be, and in this Rilke responded superbly—for not only did he continue on his dark journey, he returned to the world a gift of poetic beauty that could only have been newly forged in the burning fires of the underworld. Polikoff, Daniel. In the Image of Orpheus: Rilke: A Soul History. Wilmette, IL: Chiron Publications, 2011. Rilke, Rainer Maria. The Selected Poetry of Rainer Maria Rilke. Edited and translated by Stephen Mitchell. New York, NY: Vintage International, 1989. Sophia Rilke, qtd. in Daniel Polikoff, In the Image of Orpheus: Rilke: A Soul History (Wilmette, IL: Chiron Publications, 2011), 6. Polikoff, In the Image of Orpheus, 498. Polikoff, In the Image of Orpheus, 239. Rainer Maria Rilke, qtd. in Polikoff, In the Image of Orpheus, 447. Polikoff, In the Image of Orpheus, 16. Polikoff, In the Image of Orpheus, xvii. Rainer Maria Rilke, qtd. in Polikoff, In the Image of Orpheus, 479. Polikoff, In the Image of Orpheus, 446. Polikoff, In the Image of Orpheus, 477. Polikoff, In the Image of Orpheus, 489-90. Rainer Maria Rilke, The Selected Poetry of Rainer Maria Rilke, ed. and trans. Stephen Mitchell (New York, NY: Vintage International, 1989), 151. Polikoff, In the Image of Orpheus, 482. Rilke, The Selected Poetry of Rainer Maria Rilke, 153. Polikoff, In the Image of Orpheus, 486. The essay “The Red Book and the Red Book: Jung, Tolkien, and the Convergence of Images,” which emerged out of this presentation, is available here. To give birth to the ancient in a new time is creation. . . . This essay was the seed of what is currently being developed into my Ph.D. dissertation, which will be available in spring 2017. Many of the ideas have been expanded and revised as I have brought in new perspectives and further research. When you close your eyes and images arise spontaneously, what is it that you are seeing? The inside of your mind? Your imagination? The interior of your soul? Are you seeing something others can see also? Is it real? Is it inside just you, or inside everyone? Is it only internal, or could it be external as well? Might you actually be seeing a place, a realm, into which not only you but others also can enter? Does this realm have a name? These are questions I have often asked myself, when I close my eyes and am beckoned down some new road I have never encountered in this green world beneath the Sun, or when I read a story flowing from the pen of some author and find that I somehow already know the tale, am familiar with the names, have seen the images of these places before. Reading stories is an anamnesis, a discovery of the new found by treading down the paths of the old. Creativity, creation from the imagination, is that rediscovery, that recollection and remembrance. As C.G. Jung writes, “To give birth to the ancient in a new time is creation. . . . The task is to give birth to the old in a new time.” But how do we begin to undertake that task? And what does it look like when we do? The Red Book. Carl Gustav Jung undertook the task of giving birth to the ancient in his time by following the meandering pathways of his imagination into the darkest depths of his psyche; the images with which he returned he inscribed in black and red letters, accompanied by rich illustrations, on large pages bound by two covers of red leather. The Red Book of Westmarch. J.R.R. Tolkien set out to write a mythology—“a body of more or less connected legend,” cosmogonic myths and romantic tales whose “cycles should be linked to a majestic whole”—which came to the world in the form of The Hobbit, The Lord of the Rings, and The Silmarillion. But within the world of the story itself these tales are written out in a book that has been passed on from generation to generation: inscribed in black and red letters, accompanied by rich illustrations, in a large book bound by two covers of red leather. The book is referred to—by Tolkien who presents himself simply as the translator of this work—as The Red Book of Westmarch. At first glance the parallel names of Jung’s and Tolkien’s respective Red Books just seem to be an odd coincidence. They could not actually have anything to do with one another, or share anything in common in content. On the one hand, Jung was one of the founders of depth psychology, an explorer of the unconscious, of the archetypal realm, of the phenomenon of synchronicity, a man of Switzerland born in 1875. On the other hand, Tolkien was firmly English, a philologist, famous author of The Lord of the Rings, one of the founders of the genre of fantasy literature, a younger man born in 1892. At first glance there seems to be little common ground between the two men, let alone between their work. There have, of course, been Jungian analyses of Tolkien’s work—focusing on both the content of his fiction, and on aspects of his biography. But, as of yet, there have been few, if any, extensive “Tolkienian analyses,”  to use Lance Owens’ phrase, of Jung and his work, particularly his work with active imagination and its product: the Liber Novus, also named The Red Book. 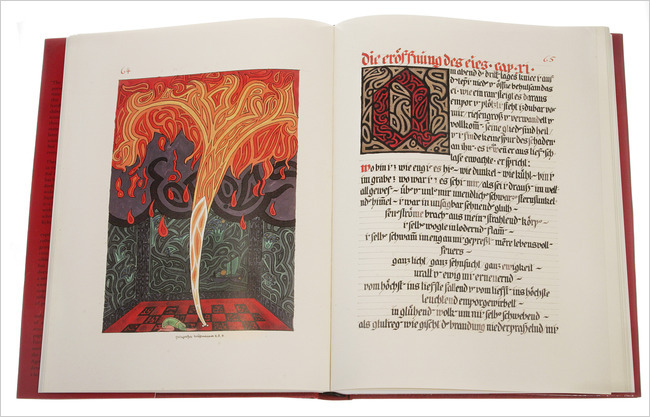 As I began to explore Jung’s Red Book in the context of Tolkien’s writings I started to find certain similarities between their work beyond the titles and color of the leather binding. There seemed to be a certain resonance between the two bodies of work, a convergence of images—a synchronicity, in Jung’s terminology—a synchronicity of imagination. The following essay is not so much the laying out of one particular thesis, but rather an exploration of this synchronicity of images, a journey through art, language, and story. Because of the nature of this exploration I will also quote at greater length than I usually might, because the original words of each of these men carries great power in themselves. The years when I was pursuing my inner images were the most important in my life—in them everything essential was decided. It all began then; the later details are only supplements and clarifications of the material that burst forth from the unconscious, and at first swamped me. It was the prima materia for a lifetime’s work. One means of understanding the simultaneity of Jung’s and Tolkien’s periods of creative imagination is archetypal astrology, which interprets archetypally the relational positions of the planets in the sky at the time Tolkien and Jung were having these unusual experiences. Yet, although astrology sheds a strong light upon the timing of the outpouring of this imaginal material, that is not the primary direction this particular essay will be taking. However, I would briefly like to point out a few significant planetary alignments before moving deeper into exploring the art and writings of Jung and Tolkien. is empirically associated with the principle of change, rebellion, freedom, liberation, reform and revolution, and the unexpected breakup of structures; with sudden surprises, revelations and awakenings, lightning-like flashes of insight, the acceleration of thoughts and events; with births and new beginnings of all kinds; and with intellectual brilliance, cultural innovation, technological invention, experiment, creativity, and originality. widespread spiritual awakenings, the birth of new religious movements, cultural renaissances, the emergence of new philosophical perspectives, rebirths of idealism, sudden shifts in a culture’s cosmological and metaphysical vision, rapid collective changes in psychological understanding and interior sensibility . . . and epochal shifts in a culture’s artistic imagination. The visionary periods of both Jung and Tolkien perfectly exemplify the characteristic manifestations of Uranus-Neptune alignments. The most potent time of both men’s imaginal experiences took place in the sunset years of the early 20th century opposition alignment, from 1913-1917. Furthermore, they were not the only of their contemporaries to be having fantasy visions and translating them into paint and the written word. The following two axial, or quadrature, alignments of Uranus and Neptune since the turn of the 20th century have also correlated to significant periods in terms of the work of both Tolkien and Jung. During the square alignment of the 1950s Tolkien’s masterpiece The Lord of the Rings was published in three volumes in 1954 and 1955. Under the same alignment, in 1957, Jung began working with Aniela Jaffé on compiling his autobiographical memoir Memories, Dreams, Reflections. Finally, under the most recent alignment of Uranus and Neptune, the conjunction that lasted from 1985-2001, the film renditions of The Lord of the Rings, directed by Peter Jackson, were produced in New Zealand, with the first installation released in December 2001. Also at the end of that same Uranus-Neptune alignment in the year 2000, the decision was made by the Society of Heirs of C.G. Jung to at last publish the long-awaited seminal work of Jung’s career, his Liber Novus, The Red Book. Besides [personality No. 1’s] world there existed another realm, like a temple in which anyone who entered was transformed and suddenly overpowered by a vision of the whole cosmos, so that he could only marvel and admire, forgetful of himself. . . . Here nothing separated man from God; indeed, it was as though the human mind looked down upon Creation simultaneously with God. It was as though a breath of the great world of stars and endless space had touched me, or as if a spirit had invisibly entered the room—the spirit of one who had long been dead and yet was perpetually present in timelessness until far into the future. Denouements of this sort were wreathed with the halo of the numen. In October, while I was alone on a journey, I was suddenly seized by an overpowering vision: I saw a monstrous flood covering all the northern and low-lying lands between the North Sea and the Alps. . . . I saw the mighty yellow waves, the floating rubble of civilization, and the drowned bodies of uncounted thousands. Then the whole sea turned to blood. This legend or myth or dim memory of some ancient history has always troubled me. In sleep I had the dreadful dream of the ineluctable Wave, either coming out of the quiet sea, or coming in towering over the green inlands. It still occurs occasionally, though now exorcized by writing about it. It always ends by surrender, and I wake gasping out of deep water. It was during Advent of the year 1913—December 12, to be exact—that I resolved upon the decisive step. I was sitting at my desk once more, thinking over my fears. Then I let myself drop. Suddenly it was as though the ground literally gave way beneath my feet, and I plunged down into dark depths. I could not fend off the feeling of panic. But then, abruptly, at not too great a depth, I landed on my feet in a soft, sticky mass. I felt great relief, although I was apparently in complete darkness. After a while my eyes grew accustomed to the gloom, which was rather like a deep twilight. Before me was the entrance to a dark cave, in which stood a dwarf with a leathery skin, as if he were mummified. I squeezed past him through the narrow entrance and waded knee deep through icy water to the other end of the cave where, on a projecting rock, I saw a glowing red crystal. I grasped the stone, lifted it, and discovered a hollow underneath. At first I could make out nothing, but then I saw that there was running water. In it a corpse floated by, a youth with blond hair and a wound in the head. He was followed by a gigantic black scarab and then by a red, newborn sun, rising up out of the depths of the water. Dazzled by the light, I wanted to replace the stone upon the opening, but then a fluid welled out. It was blood. A thick jet of it leaped up, and I felt nauseated. It seemed to me that the blood continued to spurt for an unendurably long time. At last it ceased, and the vision came to an end. In this inaugural vision of The Red Book are contained many symbolic images. But for this particular study, what stands out to me are the numerous parallels to images in Tolkien’s own works of the many underworld, underground journeys that take place in Middle-Earth: the dark journey through the lost Dwarf realm of Moria in which Gandalf is lost in a battle with Shadow and Flame; Frodo and Sam’s fearful passage through the monstrous spider Shelob’s midnight tunnel on the borders of Mordor, which has resemblance to the giant scarab Jung describes; Aragorn and the Grey Company’s journey through the Paths of the Dead, in which they encounter a dead host of restless shades, another parallel to Jung’s encounter with the Dead deeper into The Red Book; Bilbo’s encounter with the dragon Smaug in the dark halls of Erebor, the Lonely Mountain; and Bilbo’s fateful encounter with the twisted creature Gollum, whose lair was deep within a mountain cavern, upon a little island rock set within the icy waters of a subterranean lake. Upon that rock, like the red crystal of Jung’s vision, lay long-hid the One Ring, the Ring of Power made by the Dark Lord Sauron. In both stories the heart of the narrative begins here, upon this island rock, where a lost treasure of unknown power is hid, awaiting for a new hand to grasp it. 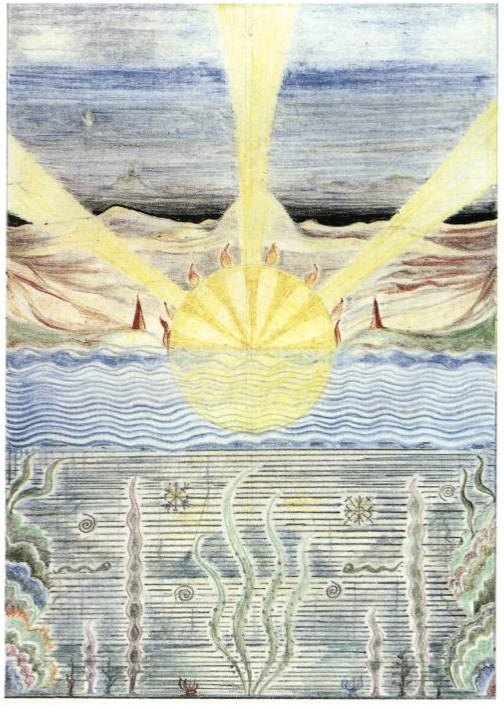 At about the same time Jung was experiencing these early fantasies, Tolkien started to draw the visionary illustrations in his Book of Ishness. Two particularly stand out in correlation to Jung’s own vision, as they seem to symbolize a similar entrance into an underworld imaginal realm. The first is titled simply Before, and depicts a dark corridor lit with flaming torches, leading to a gaping doorway from which a red glow issues ominously (see Figure 1). 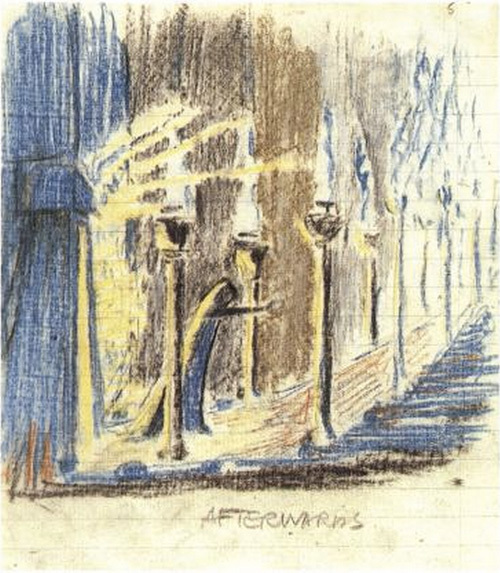 The second sketch seems to be intended to follow directly after Before: it depicts a solitary figure walking out of a doorway of the same shape as in the previous drawing, and heading down a long hall lit with many torches. The drawing is titled Afterwards (see Figure 2). The coloring is in great contrast to the stark red and black of Before; Afterwards is sketched in yellows and blues, although it too conveys a sense of darkness and gloom, yet less foreboding than the previous drawing. The Book of Ishness contained a series of Tolkien’s drawings, all of them symbolic or abstract in nature. As previously mentioned, Tolkien underwent a shift in the subjects he chose to illustrate. As Owens explains it, Tolkien felt “a need to draw not what he saw on the outside, but what he saw on the inside.” Interestingly, in 1911 not long before he began to draw his “Earliest Ishnesses,” Tolkien visited Switzerland, Jung’s homeland, for the only time in his life. He went on a walking tour through the Alps, whose majestic peaks had a tremendous impact on him. How close geographically Jung and Tolkien might have been to each other at that time, one can only guess. 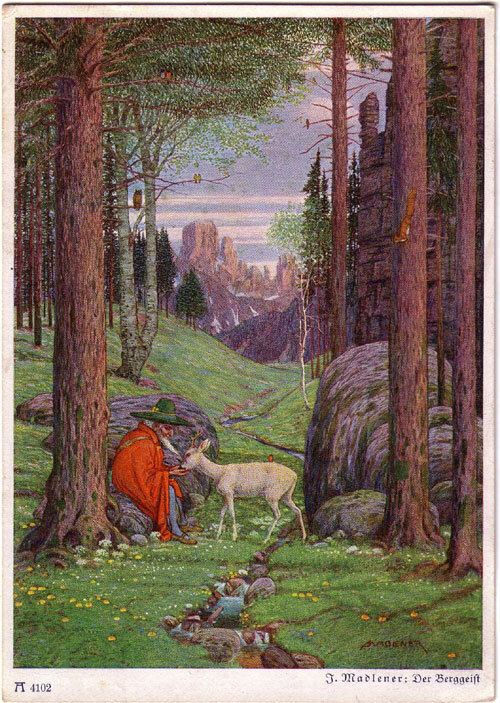 While in Switzerland Tolkien came across a postcard on which was a painting by J. Madlener, titled Der Berggeist, “the mountain spirit” (see Figure 3). The painting depicts an old man in a cloak and wide-brimmed hat, seated beneath a tree in an alpine setting. 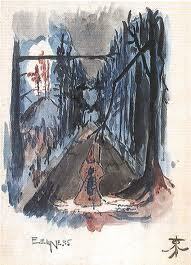 Many years later Tolkien made a note on this painting: “Origin of Gandalf.” Within The Book of Ishness Tolkien also composed a painting he entitled Eeriness, that seems to depict a wizard-like figure bearing a staff who is walking down a long road lined with dark trees (see Figure 4). Like all the illustrations in The Book of Ishness, there is no explanation of the content of the pictures beyond their titles—we can only guess what inner images of Tolkien’s they are reflecting. Perhaps the most striking of all the Ishnesses is the one titled End of the World (see Figure 5). In this drawing a small figure is stepping off of a cliff extending over the sea. The Sun is shining brightly down onto the scene, and seemingly within the water itself shine white stars, and a crescent Moon bends across the horizon line. 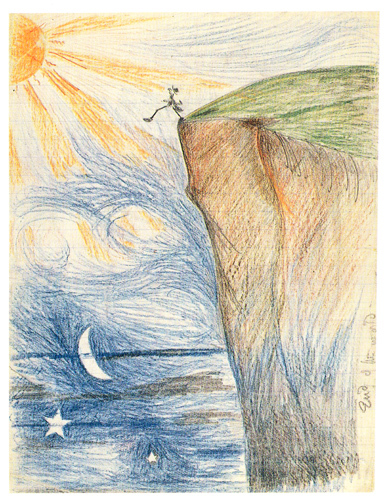 Although the image of a man stepping off a cliff, and its corresponding title, may seem to be somber, even depressing, they convey a dual meaning: this is not only the “end of the world” in reference to its demise, or to the death of the individual, but it is the “end of the world” in that the individual has reached its edge and wishes to continue on his journey. As Owens says of this image, “that fellow has stepped, and he is not falling, he is walking into a Sun, into a Moon, into Stars.” One might see End of the World as a symbol of the threshold Tolkien appears to have crossed at this time—the doorway to the imaginal, into what he called the realm of Faërie. At first the beauty of the melodies and of the interwoven words in elven-tongues, even though he understood them little, held him in a spell, as soon as he began to attend to them. Almost it seemed that the words took shape, and visions of far lands and bright things that he had never yet imagined opened out before him; and the firelit hall became like a golden mist above seas of foam that sighed upon the margins of the world. Then the enchantment became more and more dreamlike, until he felt that an endless river of swelling gold and silver was flowing over him, too multitudinous for its pattern to be comprehended; it became part of the throbbing air about him, and it drenched and drowned him. Swiftly he sank under its shining weight into a deep realm of sleep. The same year Jung’s Red Book visions began, Tolkien came across a pair of lines in an Anglo-Saxon poem titled Crist, written by the poet Cynewulf. Many years later Tolkien wrote of his finding both the names Earendel and Middle-Earth: “I felt a curious thrill . . . as if something had stirred in me, half wakened from sleep. There was something very remote and strange and beautiful behind those words, if I could grasp it, far beyond ancient English.” Tolkien felt as though he had come across something he somehow already knew, a stirring of remembrance, of anamnesis. In September 1914, just after World War I broke out and while Jung was gripped by the visions of his psychological descent, Tolkien wrote his first poem about this figure Earendel, who was to become a central character in his mythology, with the slightly altered name Eärendil. The poem is describing the journey of a lone wanderer across the night sky, a single light entering the realm of darkness before making his descent into the West, the direction in which, according to Tolkien, dwelt the Faërie realm. When Tolkien showed “The Voyage of Earendel the Evening Star” to his close friend G.B. Smith, he asked Tolkien what the poem was really about. Tolkien gave an unusual response: “I don’t know. I’ll try to find out” He always maintained that the stories he was writing were true in a sense, that he was not making them up but rather discovering them. As his biographer writes, “He did feel, or hope, that his stories were in some sense an embodiment of a profound truth.” Jung too, “maintained a ‘fidelity to the event,’ and what he was writing was not to be mistaken for a fiction.” What then was it that both men were encountering, that appeared to be an internal experience, and yet had such a profound air of reality? 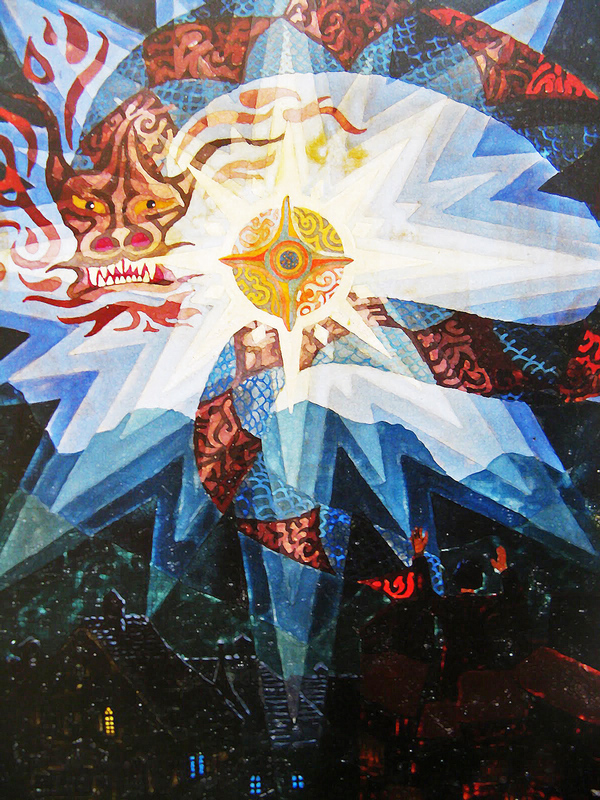 The Liber Novus, Jung’s Red Book, “depicts the rebirth of God in the soul.” The Red Book is “Jung’s descent into Hell” and is “an attempt to shape an individual cosmology.” Tolkien’s own Red Book, in the form of his mythology and The Lord of the Rings, is also an attempt to shape an individual cosmology and cosmogony, a world containing the God he loved and worshipped. And Tolkien also depicted a descent into Hell—into Mordor, and into worse Hells: the dark realm of Thangorodrim, the darkness of lost and corrupted souls. Both Jung and Tolkien were drawn to the style of medieval manuscripts, with their calligraphy and illuminated letters, and emulated the medieval aesthetic in their artwork. Jung spoke of the style of language in which he wrote The Red Book, saying: “First I formulated the things as I had observed them, usually in ‘high flown language,’ for that corresponds to the style of the archetypes. Archetypes speak the language of high rhetoric, even of bombast.” The language used in Tolkien’s Silmarillion, and even in the latter chapters of The Lord of the Rings, has a similar tone, sounding mythic, almost Biblical in nature. Flow or aggregate of images and ideas in the unconscious Psyche, constituting its most characteristic activity. To be distinguished from thought or cognition. . . . “Active” fantasies, on the other hand, do require assistance from the ego for them to emerge into consciousness. When that occurs, we have a fusion of the conscious and unconscious areas of the psyche; an expression of the psychological unity of the person. The Jungian dictionary finds a contradiction in the further definition of Fantasy, saying that Jung seemed to have “two disparate definitions of fantasy: (a) as different and separate from external reality, and (b) as linking inner and outer worlds.” Although these definitions seem contrary, perhaps when read in light of Tolkien’s definition of “Fantasy” they may not seem to be quite as at odds as first appears: “Fantasy, the making or glimpsing of Other-worlds, was the heart of the desire of Faërie.” Tolkien goes on to say, “Fantasy is a natural human activity. It certainly does not destroy or even insult Reason; and it does not either blunt the appetite for, nor obscure the perception of, scientific verity.” He also adds, “Fantasy is a rational not an irrational activity.” According to this definition, Fantasy appears highly similar to Jung’s practice of active imagination, that links a person of the external world to the internal realm of Faërie, yet is also the very heart of that separate realm of the Imagination. 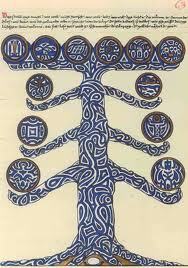 men painted multiple times was of a great tree, that could be seen as the World Tree or the Tree of Tales. 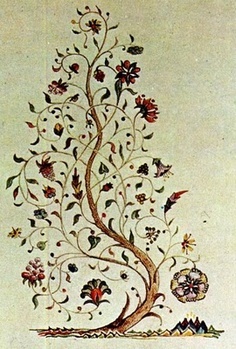 Tolkien “regularly” drew what he called the Tree of Amalion, which particularly resembled a single tree painted in Jung’s Red Book with large ornaments situated upon each branch (See Figures 10 and 11). Jung wrote in his memoir, “Trees in particular were mysterious and seemed to me direct embodiments of the incomprehensible meaning of life. For that reason the woods were the place where I felt closest to its deepest meaning and to its awe-inspiring workings.” Trees were beloved, even sacred, to Tolkien: “he liked most of all to be with trees. He would like to climb them, lean against them, even talk to them.” The entrance to the realm of Faërie, for Tolkien, lay not underground, as was depicted in many traditional fairy-stories, but through the woods; in the world of trees lay the transition between realities. 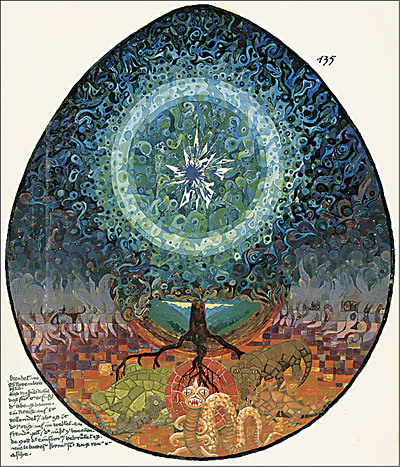 While for Jung the archetype of the World Tree played a significant role, Tolkien’s mythology had at its heart not one World Tree but two, the Two Trees of Valinor, whose intermingling silver and gold lights illuminated the newly created world before the Sun and Moon were formed of their last fruit and flower. The dark sea breaks heavily—a reddish glow spreads out in it—it is like blood—a sea of blood foams at my feet—the depths of the sea glow—how strange I feel—am I suspended by my feet? Is it the sea or is it the sky? Blood and fire mix themselves together in a ball—red light erupts from its smoky shroud—a new sun escapes from the bloody sea, and rolls gleamingly toward the uttermost depths—it disappears under my feet. And the deeps rose beneath them in towering anger, and waves like unto mountains moving with great caps of writhen snow bore them up amid the wreckage of the clouds, and after many days cast them away upon the shores of Middle-earth. And all the coasts and seaward regions of the western world suffered great change and ruin in that time; for the seas invaded the lands, and shores foundered, and ancient isles were drowned, and new isles were uplifted; and hills crumbled and rivers were turned into strange courses. The name Númenor, given to the island kingdom that sank beneath the waves in divine retribution for a mortal transgression of hubris, has often been mistakenly written as “Numinor,” even by Tolkien’s close friend C.S. Lewis. Tolkien felt such a mistake came from associating the name with the Latin numen, numina that is the root of the word “numinous,” a term of particular significance to Jung. Tolkien explains that the name Númenor is actually derived from the Eldarin base NDU, meaning “below, down, descend.” This base is the root of the Quenya word nume, meaning “going down, occident,” and númen “the direction or region of the sunset.” Not only does the mistaken name of the land that sank beneath the Great Wave refer to the numinous, but the actual name implies a descent, the very term used for the psychological process Jung was undergoing during his Red Book period. “A way has been found. You have become light, lighter than a feather. Now I can carry you.” I put my arms round him and lift him up from the ground; he is lighter than air, and I struggle to keep my feet on the ground since my load lifts me up into the air. Significant in itself, this scene of carrying one who ought to be heavy yet is somehow light also has a resemblance to one of the most moving moments in The Lord of the Rings, when Sam and Frodo are struggling up the treacherous slopes of Mount Doom. “Now for it! Now for the last gasp!” said Sam as he struggled to his feet. He bent over Frodo, rousing him gently. Frodo groaned; but with a great effort of will he staggered up; and then he fell upon his knees again. He raised his eyes with difficulty to the dark slopes of Mount Doom towering above him, and then pitifully he began to crawl forward on his hands. As Frodo clung upon his back, arms loosely about his neck, legs clasped firmly under his arms, Sam staggered to his feet; and then to his amazement he felt the burden light. He had feared that he would have barely strength to lift his master alone, and beyond that he had expected to share in the dreadful dragging weight of the accursed Ring. But it was not so. Whether because Frodo was so worn by his long pains, wound of knife, and venomous sting, and sorrow, fear, and homeless wandering, or because some gift of final strength was given to him, Sam lifted Frodo with no more difficulty than if he were carrying a hobbit-child pig-a-back in some romp on the lawns or hayfields of the Shire. He took a deep breath and started off. Perhaps one of the most profound areas in which the fantasy visions, and respective world views, of Jung and Tolkien overlap is around the nature of evil. They both had a deep understanding of the nature of evil, and were able to articulate its presence in the world in a way that demonstrates the importance of confronting that evil and going into its depths on behalf of personal and collective transformation. Yet not only do Tolkien and Jung share a similar understanding of the workings of evil, they also share uncannily similar depictions of evil nature in both their art and writing. Within The Lord of the Rings, the clearest view we are given of the Dark Lord is his great Eye, “an image of malice and hatred made visible . . . the Eye of Sauron the Terrible [that] few could endure.” Frodo has two separate visions of the Eye, each more terrifying than the last. The first is while gazing into the Mirror of Galadriel in the woods of Lothlórien. But suddenly the Mirror went altogether dark, as dark as if a hole had opened in the world of sight, and Frodo looked into emptiness. In the black abyss there appeared a single Eye that slowly grew, until it filled nearly all the Mirror. So terrible was it that Frodo stood rooted, unable to cry out or to withdraw his gaze. The Eye was rimmed with fire, but was itself glazed, yellow as a cat’s, watchful and intent, and the black slit of its pupil opened on a pit, a window into nothing. Then the Eye began to rove, searching this way and that; and Frodo knew with certainty and horror that among the many things that it sought he himself was one. All hope left him. And suddenly he felt the Eye. There was an eye in the Dark Tower that did not sleep. He knew that it had become aware of his gaze. A fierce eager will was there. It leaped towards him; almost like a finger he felt it, searching for him. Very soon it would nail him down, know just exactly where he was. Nothing is more valuable to the evil one than his eye, since only through his eye can emptiness seize gleaming fullness. Because the emptiness lacks fullness, it craves fullness and its shining power. And it drinks it in by means of its eye, which is able to grasp the beauty and unsullied radiance of fullness. The emptiness is poor, and if it lacked its eye it would be hopeless. It sees the most beautiful and wants to devour it in order to spoil it. The eye that symbolizes evil is an eye that looks only outward; it does not look inward, it does not self-reflect. The eye as symbol of evil cautions against the refusal to look deep into one’s innermost self, to face the Shadow within. If one only looks outward one becomes subsumed by that Shadow; it is all the world can see although the eye may be blind to it from within. Indeed, both Jung and Tolkien even used the term Shadow to refer to this darkness that must be faced and reflected upon. “He who journeys to Hell also becomes Hell: therefore do not forget from whence you come . . . do not be heroes . . .” Jung writes in The Red Book. Indeed, the two Hobbits who journey into Hell, into Mordor, are not Heroes. They are but simple folk who do the task that is at hand, that has been set before them by the greater powers of the world. But Frodo succumbs to the Hell into which he enters; at the final moment when he is meant to throw the One Ring into the Cracks of Doom, within the heart of the volcano Orodruin, Mount Doom, he cannot do it. He takes the Ring for himself. Then Frodo stirred and spoke with a clear voice, indeed with a voice clearer and more powerful than Sam had ever heard him use, and it rose above the throb and turmoil of Mount Doom, ringing in the roof and walls. “I have come,” he said. “But I do not choose now to do what I came to do. I will not do this deed. The Ring is mine!” And suddenly, as he set it on his finger, he vanished from Sam’s sight. Frodo has, in that pivotal moment, become the evil he had set out to destroy. But it is only through that act, and through his ultimate sacrifice, that the quest can in the end be achieved. 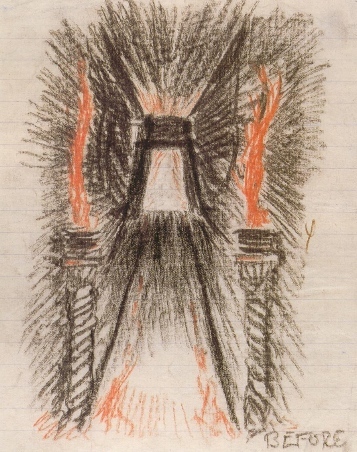 In the same section of The Red Book in which Jung writes of the eye of evil, he also writes, “the scene of the mystery play is the heart of the volcano.” The moment of transformation, the unexpected turn that Tolkien calls the eucatastrophe, takes place in the fiery heart of the volcanic underworld. 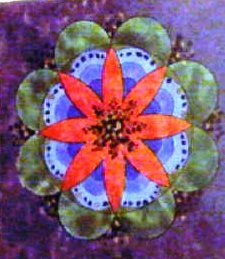 A form of art that Jung found to have particular significance in the psychological journey was the mandala, a circular and quadratic emblem that he came to recognize as a symbol of the Self. Without knowing what at first he was doing, Jung drew his first mandala on January 16, 1916 (see Figure 14). He came to understand that the mandala form represented “Formation, transformation, the eternal mind’s eternal recreation.” In Tolkien’s artwork I did not expect to also find drawings of mandalas, and yet it seems that towards the end of his life he would wile away the time drawing ornate patterns on the backs of envelopes and on newspapers as he solved the crossword. 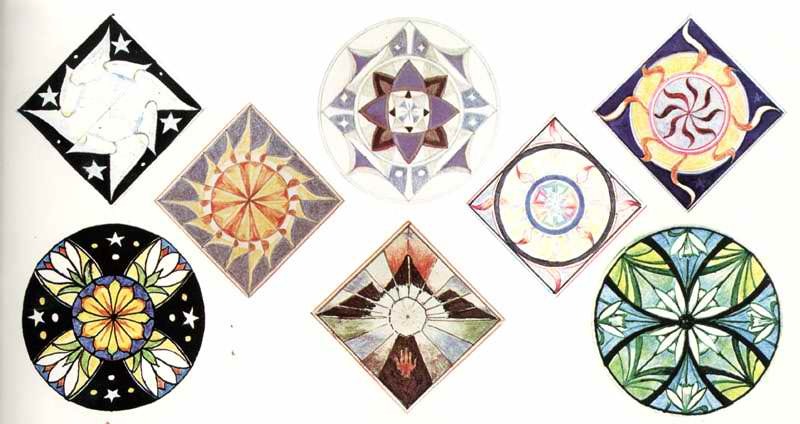 Many of these emblems, which he later designated as Elvish heraldic devices symbolizing individual characters within his mythology, were mandalic in form (see Figure 15), as were some others of his more complete drawings (see Figure 16). 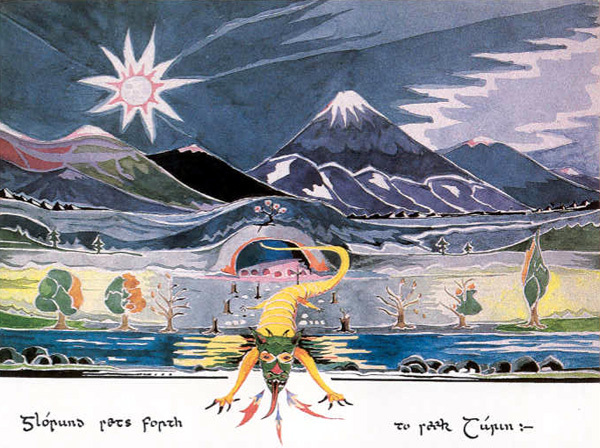 Yet another interesting quality of Tolkien’s art was that he often designed his pictures around a central axis. 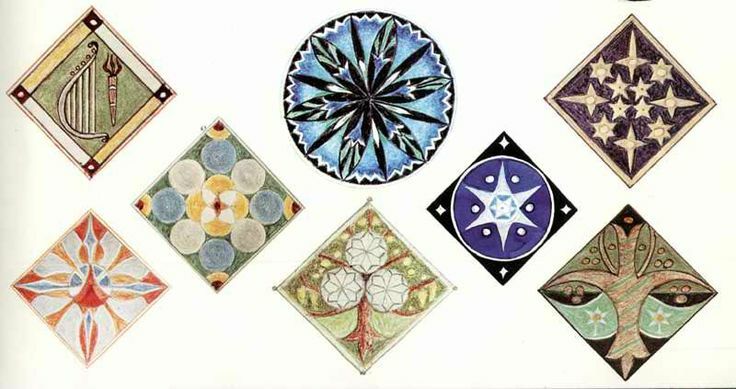 If one were to imagine moving from the sideways perspective portrayed in the drawing to a bird’s eye view from above, these illustrations of Tolkien’s quite likely would resemble a mandala (see Figures 17 and 18). “If the encounter with the shadow is the ‘apprentice-piece’ in the individual’s development, then that with the anima is the ‘master-piece.’” Jung wrote these words in reference to his own visionary experiences, as well as the experiences of the patients with whom he worked. We have already explored parallels in Jung’s and Tolkien’s encounters with the Shadow. But what of the encounter with Anima? The Anima for Jung is the female personification of the soul of a man, and the Animus is the male personification of the soul of a woman. Anima figures can take many forms, of course based upon the psychology of each individual. For Jung, one of the personifications of his Anima whom he encountered in the physical world at a young age was a girl he met briefly while walking in the Swiss mountains. As they began to descend the mountain side by side, he said “. . . a strange feeling of fatefulness crept over me. ‘She appeared at just this moment,’ I thought to myself, ‘and she walks along with me as naturally as if we belonged together.’” Reflecting later on the encounter, he wrote, “. . . seen from within, it was so weighty that it not only occupied my thoughts for days but has remained forever in my memory, like a shrine by the wayside.” This girl was one of several women who represented an Anima image for Jung, the female symbol of his soul. The last story that Tolkien ever wrote in his life was called Smith of Wootton Major. It is a short story of a man who, as a child, is given a fay star, an emblem from the realm of Faërie, that grants him passageway into that enchanted world. On one of his journeys through Faërie this man encounters, in a high mountain meadow, a beautiful dancing maiden. On the inner side the mountains went down in long slopes filled with the sound of bubbling waterfalls, and in great delight he hastened on. As he set foot upon the grass of the Vale he heard elven voices singing, and on a lawn beside a river bright with lilies he came upon many maidens dancing. The speed and the grace and the ever-changing modes of their movements enchanted him, and he stepped forward towards their ring. Then suddenly they stood still, and a young maiden with flowing hair and kilted skirt came out to meet him. She laughed as she spoke to him, saying: “You are becoming bold, Starbrow, are you not? Have you no fear what the Queen might say, if she knew of this? Unless you have her leave.” He was abashed, for he became aware of his own thought and knew that she read it: that the star on his forehead was a passport to go wherever he wished; and now he knew that it was not. But she smiled as she spoke again: “Come! Now that you are here you shall dance with me”; and she took his hand and led him into the ring. On that visit he had received a summons and had made a far journey. Longer it seemed to him than any he had yet made. He was guided and guarded, but he had little memory of the ways that he had taken; for often he had been blindfolded by mist or by shadow, until at last he came to a high place under a night-sky of innumerable stars. There he was brought before the Queen herself. She wore no crown and had no throne. She stood there in her majesty and her glory, and all about her was a great host shimmering and glittering like the stars above; but she was taller than the points of their great spears, and upon her head burned a white flame. She made a sign for him to approach, and trembling he stepped forward. A high clear trumpet sounded, and behold! they were alone. He stood before her, and he did not kneel in courtesy, for he was dismayed and felt that for one so lowly all gestures were in vain. At length he looked up and beheld her face and her eyes bent gravely upon him; and he was troubled and amazed, for in that moment he knew her again: the fair maid of the Green Vale, the dancer at whose feet the flowers sprang. She smiled seeing his memory, and drew towards him; and they spoke long together, for the most part without words, and he learned many things in her thought, some of which gave him joy, and others filled him with grief. . . .
Then he knelt, and she stooped and laid her hand on his head, and a great stillness came upon him; and he seemed to be both in the World and in Faery, and also outside them and surveying them, so that he was at once in bereavement, and in ownership, and in peace. When after a while the stillness passed he raised his head and stood up. The dawn was in the sky and the stars were pale, and the Queen was gone. Far off he heard the echo of a trumpet in the mountains. The high field where he stood was silent and empty: he knew that his way now led back to bereavement. The encounter with the Queen of Faery may be as significant as the encounter with the Anima, and perhaps that is who the Queen of Faery is. Smith of Wootton Major is considered to be something of an autobiographical tale, or as close as Tolkien would ever come to writing one. Perhaps he is writing of his own encounter with his Anima, or rather an encounter with the archetype of Anima as present in all myths, within the individual human soul and in the mythic dimensions of the cosmos. The symbol is the word that goes out of the mouth, that one does not simply speak, but that rises out of the depths of the self as a word of power and great need and places itself unexpectedly on the tongue. . . . If one accepts the symbol, it is as if a door opens leading into a new room whose existence one previously did not know. Symbols are present in myths and stories, and in the living visions of the creative imagination. Symbolic, archetypal story can open doorways between the conscious and the unconscious, between this world and the enchanted realm of Faërie. “Such stories,” Tolkien writes, “open a door on Other Time, and if we pass through, though only for a moment, we stand outside our own time, outside Time itself maybe.” Perhaps Fantasy, or Imagination itself, are the transcendent function of which Jung speaks. I daresay something had been going on in the “unconscious” for some time, and that accounts for my feeling throughout, especially when stuck, that I was not inventing but reporting (imperfectly) and had at times to wait till “what really happened” came through. I have come to believe that Imagination is a place, a realm, that is both inner and outer. The Imagination is not merely a human capacity, a function of the mind or the workings of the brain. It is a place that can be accessed through human capacity, through creativity, but Imagination extends far beyond human capacity as well. It is a world as infinite as the physical one in which we daily dwell. Carpenter, Humphrey. J.R.R. Tolkien: A Biography. New York, NY: Houghton Mifflin Company, 2000. Flieger, Verlyn. A Question of Time: J.R.R. Tolkien’s Road to Faërie. Kent, OH: The Kent State University Press, 1997. Hammond, Wayne G. and Christina Scull. J.R.R. Tolkien: Artist & Illustrator. New York, NY: Houghton Mifflin Company, 2000. Jung, C.G. “Archetypes of the Collective Unconscious.” In Collected Works. Vol. 9, i. Princeton, NJ: Princeton University Press, 1959. –––––. Memories, Dreams, Reflections. Edited by Aniela Jaffé. Translated by Richard and Clara Winston. New York, NY: Vintage Books, 1989. –––––. The Red Book: Liber Novus. Edited by Sonu Shamdasani. Translated by Mark Kyburz, John Peck, and Sonu Shamdasani. New York, NY: W.W. Norton & Company, 2009. Samuels, Andrew, Bani Shorter and Fred Plant. A Critical Dictionary of Jungian Analysis. New York, NY: Routledge & Kegan Paul, 1986. Tolkien, J.R.R. The Letters of J.R.R. Tolkien. Edited by Humphrey Carpenter, with Christopher Tolkien. New York, NY: Houghton Mifflin Company, 2000. –––––. “On Fairy-Stories.” In The Monsters and the Critics. Edited by Christopher Tolkien. London, England: HarperCollins Publishers, 2006. –––––. “Smith of Wootton Major.” In Tales from the Perilous Realm. London, England: HarperCollinsPublishers, 2002. C.G. Jung, The Red Book: Liber Novus, ed. Sonu Shamdasani, trans. Mark Kyburz, et al. (New York, NY: W.W. Norton & Company, 2009), 311. J.R.R. Tolkien, “On Fairy-Stories” in The Monsters and the Critics, ed. Christopher Tolkien (London, England: HarperCollins Publishers, 2006), 145. J.R.R. Tolkien, qtd. in Humphrey Carpenter, J.R.R. Tolkien: A Biography (New York, NY: Houghton Mifflin Company, 2000), 97. Tolkien, qtd. in Carpenter, J.R.R. Tolkien: A Biography, 98. Lance Owens, “Lecture III: Tolkien and the Imaginative Tradition,” in J.R.R. Tolkien: An Imaginative Life, (Salt Lake City, UT: Westminster College, 2009), http://gnosis.org/tolkien/lecture3/index.html. Ulrich Hoerni, “Preface,” in Jung, The Red Book, VIII. Jung, The Red Book, 200. Wayne G. Hammond and Christina Scull, J.R.R. Tolkien: Artist & Illustrator (New York, NY: Houghton Mifflin Company, 2000), 40. Hammond and Scull, J.R.R. Tolkien: Artist & Illustrator, 50. Lance Owens, “Tolkien, Jung, and the Imagination,” interview with Miguel Conner, AeonBytes Gnostic Radio, April 2011, http://gnosis.org/audio/Tolkien-Interview-with-Owens.mp3. C.G. Jung, Memories, Dreams, Reflections, ed. Aniela Jaffé, trans. Richard and Clara Winston (New York, NY: Vintage Books, 1989), 199. Richard Tarnas, Cosmos and Psyche: Intimations of a New World View (New York, NY: Viking Penguin, 2006), 365. Tarnas, Cosmos and Psyche, 355. Tarnas, Cosmos and Psyche, 356. Sonu Shamdasani, “Introduction,” in Jung, The Red Book, 204. Tarnas, Cosmos and Psyche, 365. Hoerni, “Preface,” in Jung, The Red Book, IX. Jung, Memories, Dreams, Reflections, 33. Carpenter, J.R.R. Tolkien: A Biography, 13. Jung, The Red Book, 196. Jung, The Red Book, 203. Hammond and Scull, J.R.R. Tolkien: Artist & Illustrator, 40. Jung, Memories, Dreams, Reflections, 175. Carpenter, J.R.R. Tolkien: A Biography, 31. J.R.R. Tolkien, The Letters of J.R.R. Tolkien, ed. Humphrey Carpenter, with Christopher Tolkien (New York, NY: Houghton Mifflin Company, 2000), 347. Lance Owens, “Lecture I: The Discovery of Faërie,” in J.R.R. Tolkien: An Imaginative Life, (Salt Lake City, UT: Westminster College, 2009), http://gnosis.org/tolkien/lecture1/index.html. Carpenter, J.R.R. Tolkien: A Biography, 193. Hoerni, “Preface,” in Jung, The Red Book, VIII. Jung, Memories, Dreams, Reflections, 179. Verlyn Flieger, A Question of Time: J.R.R. Tolkien’s Road to Faërie (Kent, OH: The Kent State University Press, 1997), 260, n. 2. Carpenter, J.R.R. Tolkien: A Biography, 57-8. Carpenter, J.R.R. Tolkien: A Biography, 59. Mark Kyburz, John Peck, and Sonu Shamdasani, “Translators’ Note,” in Jung, The Red Book, 222. Owens, “Tolkien, Jung, and the Imagination,” interview with Miguel Conner. Carpenter, J.R.R. Tolkien: A Biography, 44. J.R.R. Tolkien, The Lord of the Rings: The Fellowship of the Ring (New York, NY: Houghton Mifflin Company, 1994), II, i, 227. Carpenter, J.R.R. Tolkien: A Biography, 72. Carpenter, J.R.R. Tolkien: A Biography. Jung, Memories, Dreams, Reflections, 227. Carpenter, J.R.R. Tolkien: A Biography, 83. Shamdasani, “Introduction,” in Jung, The Red Book, 202. Jung, Memories, Dreams, Reflections, 177-8. Andrew Samuels, et al., A Critical Dictionary of Jungian Analysis (New York, NY: Routledge & Kegan Paul, 1986), 58. Samuels, et al., A Critical Dictionary of Jungian Analysis, 59. Hammond and Scull, J.R.R. Tolkien: Artist & Illustrator, 64. Jung, Memories, Dreams, Reflections, 67-8. Carpenter, J.R.R. Tolkien: A Biography, 30. Flieger, A Question of Time, 165. Jung, The Red Book, 274. Tolkien, The Letters of J.R.R. Tolkien, 213. Tolkien, The Lord of the Rings: The Fellowship of the Ring, II, vii, 354. J.R.R. Tolkien, The Silmarillion (New York, NY: Houghton Mifflin Company, 2001), 280. Tolkien, The Letters of J.R.R. Tolkien, 361. Jung, The Red Book, 282. J.R.R. Tolkien, The Lord of the Rings: The Return of the King (New York, NY: Houghton Mifflin Company, 1994), VI, iii, 919-20. Tolkien, The Lord of the Rings: The Fellowship of the Ring, II, vii, 355. Jung, The Red Book, 289. Jung, The Red Book, 244. Tolkien, The Lord of the Rings: The Return of the King, VI, iii, 924. Jung, The Red Book, 247. Jung, Memories, Dreams, Reflections, 221. Carpenter, J.R.R. Tolkien: A Biography, 242. Hammond and Scull, J.R.R. Tolkien: Artist & Illustrator, 149. C.G. Jung, “Archetypes of the Collective Unconscious,” in Collected Works, vol. 9, i (Princeton, NJ: Princeton University Press, 1959), 29. Jung, Memories, Dreams, Reflections, 79. J.R.R. Tolkien, “Smith of Wootton Major,” in Tales from the Perilous Realm (London, England: HarperCollinsPublishers, 2002), 160-1. Jung, The Red Book, 198, n. 39. Tolkien, “Smith of Wootton Major,” 162-4. Samuels, et al., A Critical Dictionary of Jungian Analysis, 150. Jung, The Red Book, 311. Jung, Memories, Dreams, Reflections, 138. Tolkien, The Letters of J.R.R. Tolkien, 212. Jung, The Red Book, 216. Carpenter, J.R.R. Tolkien: A Biography, 98. Jung, The Red Book, 217.